If you workout regularly and strenuously, at one point or the other you must have suffered from muscle fatigue. It is usually a result of overtraining, incorrect posture, exercising your muscles beyond your current endurance level and/or improper nutrition. After exercise, your muscles might ache, and you might find it hard to do anything beside crash in a chair from the fatigue you feel. Below are five ways in which you can help your muscles regain their normal functionality. Stretch - Every trainer out there will tell you that you MUST stretch before and after your workout. Usually this is the step that most people decide to skip unfortunately. Focus on the muscle group you worked out that day while stretching and hold each stretch for about 15 seconds. Refuel - Within 45 minutes after your workout have some form of protein. This would stop your muscle breakdown. Replenish - Drink water during and after your workout. Fluids help your muscles contract, relax and remain less irritable. Rest - Muscle fatigue can often be an indication that you pushed yourself harder than you should have. Rest your muscles for 24 to 48 hours before exercising again. This will help your muscles recover from activity and store new energy for your next workout. Relief - For targeted pain, you can use LivRelief. Lately, I have been pushing myself to improve my strength and endurance which resulted in a sore shoulder. Soon after it got bad enough that I could not lift my hand above my waist. I instantly applied LivRelief on the area. It acted fast and had a long lasting effect. 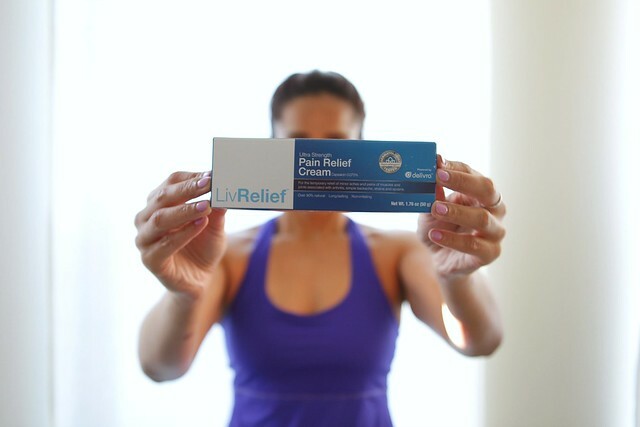 Delivra helps LivRelief’s active ingredients penetrate the skin and get to the root of the pain. The Delivra technology, which is patent-pending, also incorporates natural molecules that bind to opioid receptors and eliminate the burning sensation common to products containing capsaicin, LivRelief’s active ingredient. Unlike other pain-relief products that burn or tingle when applied, or smell like menthol or worse, LivRelief doesn’t produce any unpleasant sensations. It has a pleasant, faint fragrance. I hope you are not suffering from any muscle pain post workout, but in case you ever you, you can easily purchase LivRelief via Amazon and receive $2 off when you use promo code ONU56TLN during checkout. This product was sent to me for review purposes. You must have been working out really hard to not be able to lift your your hand above your waist! Girl, I don't have that kind of stamina!! I never really think about topical treatments for muscle soreness, I usually go for the Advil. This could be a better way to go though. Thanks!